Excerpted and adapted from the Symmetry article World’s biggest neutrino experiment moves one step closer, 23 June 2017. In a lab at CERN sits a very important box. It covers about three parking spaces and is more than a story tall. Sitting inside is a metal device that tracks energetic cosmic particles: the prototype detector WA105 3x1x1, which holds an active volume of five metric tons (3,000 liters) of liquid argon. 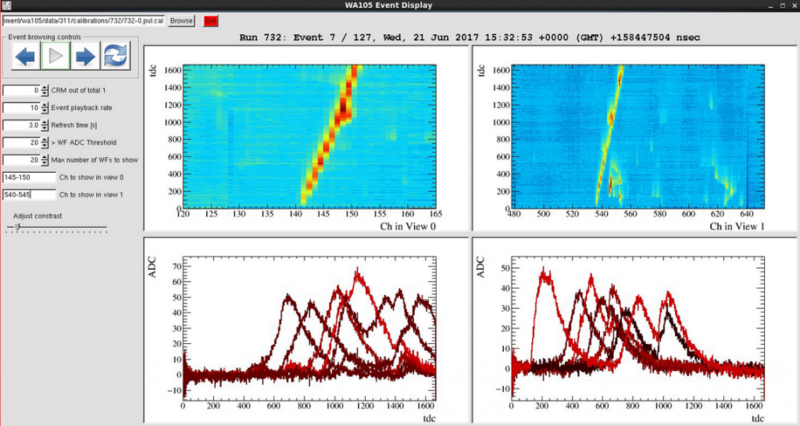 On June 21, WA105 recorded its first particle tracks. One of the first tracks in the prototype detector, caused by a cosmic ray. While ultimately the full-scale DUNE detectors will sit in the most intense neutrino beam in the world, scientists are testing the WA105 3x1x1 components using muons from cosmic rays, high-energy particles arriving from space. Making sure a dual-phase detector and its electronics work at cryogenic temperatures of minus 184 degrees Celsius (minus 300 degrees Fahrenheit) on a large scale is the primary duty of the prototype detector—but certainly not its only one. The membrane that surrounds the liquid argon and keeps it from spilling out will also undergo a rigorous test. Special cryogenic cameras look for any hot spots where the liquid argon is predisposed to boiling away and might cause voltage breakdowns near electronics.